Geographic illiteracy has become a disease of epidemic proportions! Why? THE WORLD of education is still reeling from the shock! A report released just last December by the Association of American Geographers and the National Council for Geographic Education declared, in no uncertain terms, that the United States is rapidly becoming a nation of "geography illiterates"! The report cited a 1983 test in geography developed by prominent educators and administered by the Dallas Times — Herald to American 12-year-olds. More than 20 percent of the students could not find the United States on a world map. Another 20 percent identified Brazil as the United States! The report also said that in an American college-level survey of global understanding by the Educational Testing Service, the median score was an appalling 42.9 out of a possible 101! "There is a huge number of children and adults who haven't a clue about the relationship between geography and history or geography and anything else," observes Dr. Bob Aangeenbrug, executive director of the Association of American Geographers. "We now have a generation that has a limited capacity to put those things together." The Sinai Desert is in Vietnam. Angola is in the Philippines. French and Latin are the most widely spoken languages in Latin America. Africa is the world's most populous nation. Mexico and Canada were the last two states admitted to the United States. It would appear that some high school students are a bit confused — to say the least. The same study also revealed that only 23 percent — fewer than one out of four — had any idea of the distance between New York and San Francisco. Only 28 percent could guess close to the U.S. population. Only 15 percent could identify Ottawa as the capital of Canada. And 41 percent didn't know that China is the world's most heavily populated nation. • Only one out of 25 could give the world's approximate population. • More than half thought England is located on the European continent. • More than one in four thought the Rocky Mountains lay east of the Mississippi River. • More than one out of three could not locate Alaska on a blank world map. • Nearly half could not find Los Angeles. Even more amazing, a government — funded study of American college students revealed that many of them — like their younger brothers and sisters — are also confused about just where the United States is! Asked to circle the region of the world where they were born, some circled the words Central America or South America. As it turned out, those who had circled Central America had been born in the Midwest, and those who had circled South America were from Tennessee, Georgia and other southeastern states! It's laughable — or is it? For decades now, pollsters have had a field day documenting the geographic illiteracy of high school and college students. What disturbs pollsters the most is the incredible lack of knowledge about the vitally important concerns of the day — issues that are widely reported and discussed in the news media. During the Vietnam War, for example, many American students could not even come near to locating Vietnam on a world map! Many had not even heard of Laos. A government survey just a few years ago showed that an amazing 40 percent of American high school seniors thought Israel was an Arab country! And that the late Golda Meir had been president of Egypt! In another study, a majority of students at a major university did not know that war-torn El Salvador is in Central America! At another university, 42 percent of geography students couldn't find London on a map! Even more disturbing are the revelations of recent years about the ignorance of basic geography at high levels in the U.S. government. In one widely publicized incident, a newly appointed ambassador to an Asian country had no idea that there were two governments on the Korean peninsula — one in communist' North Korea and one in noncommunist South Korea. Nor did this person know the capital of Australia (Canberra) — or even recognize the name when he heard it! A well-read 10-year-old in many countries could have easily set these individuals straight! Americans today know dangerously little about the world. For many Americans, the world stops at the edge of town. This hazy knowledge of the world beyond America's doorstep is a continual source of amazement to foreign-born students studying in American colleges and universities. Geography was one of the first basic subjects to be relegated to a cellar position in the American high school and college. Today, nine out of 10 graduating high school and college students have not been exposed to even one course in the subject! The average high school student in the United States today takes 30 percent less geography than students a generation ago. And a generation ago students took precious little! The vast majority of high schools no longer teach world geography as a separate subject. Geography has either dropped out of the curriculum completely, or has been lumped in with "social studies" an amalgam of history, economics, government, sociology and related subjects. And even social studies as a whole are being slighted. "Certainly, there are many reasons for this [geographic] illiteracy," observes Dr. Aangeenbrug of the Association of American Geographers. "But the main reason is simply that geography is just not taught in this country [the United States]. This is the only major nation in the world where geography is not required in many curriculums." He adds that part of the problem is that teachers themselves are not well educated in geography. Educators used to believe that a person was not educated if he was ignorant of the world in which he lives. Not so today! Among the questions asked in an 1875 U.S. high school entrance examination were: "Name the countries of Europe, Asia and Africa that touch upon the Mediterranean Sea" and "Name the states of the union bordering on the Atlantic, on the Gulf of Mexico, on the Pacific and on the Great Lakes." How many young Americans entering high school today could answer these questions? How many high school graduates? How many college students or graduates? And how many who admittedly don't know would be motivated enough to find out? Few American high schools are acting like high schools these days. In many, the basics have been abandoned in favor of the "trendy" and the "innovative." At a time when too many young people can't read, compose a simple paragraph or locate their own country on a world map, courses such as "Rock Music as Literature" and "Basic TV Production" have replaced what once were core classes of basic knowledge. As a result, ignorance and illiteracy are rampant on high school and college campuses! Education is in deep trouble. The decay of schooling in America is more serious than many realize. Declining achievement rates on basic elements of knowledge have declared that fact for years. Yet high schools and colleges seem unable to counter the trend. Modern education is adrift on a sea of false values, driven by winds of fluctuating trends and fashions. Few seem to be able to agree even on the goals of education, much less the methods of achieving them. Education has rejected the foundation of all knowledge. That foundation is the Bible! Having cut anchor from this foundation, modern education has drifted off course and has lost its way! It's only logical. Without a knowledge of the true purpose of life, institutions simply cannot provide the proper education toward achieving it! Thus, high schools pander to irrelevant student interests rather than provide a real education. Students are graduated lacking even the most basic skills necessary for success. Colleges and universities gear to overspecialization. They focus on the postgraduate paycheck, teaching students how to make a living, but not how to live! To anyone willing to take a realistic look at modern education, the appalling picture becomes painfully clear! Rather than producing educated graduates to mold and shape society for the good, modern institutions of "learning" have yielded to society. Rather than helping to overcome society's ills, they have been overcome by a decadent and aimless age! Geographic illiteracy is a prime example. Today's lack of basic geographical understanding is a vivid reflection of modern society. It's a symptom of the "Me" epidemic that has been widespread in recent times, of the "look-out-for-Number-One" syndrome. The attitude of many today is simply: "Why concern myself with anything outside my own individual world?" The average American and too often the average Westerner are busy with their personal day-to-day affairs, too isolationist to be concerned with the international scene. Students are too narrowly focused on career-related matters to contemplate goings-on in, for instance, Albania (where's that?). Yet our age demands an accurate understanding of the basic facts of world geography and international affairs! "We desperately need a population that can read maps," one major weekly magazine recently declared. But where is such a population? We are living at a crucial time in world history. Forces are even now converging that will soon propel this world into a time of unparalleled chaos and calamity! Regular readers of The Plain Truth are aware of the ancient prophecies that are soon to be fulfilled in world news. Now more than ever before, it is time to WATCH world news — and watch it with understanding! It is impossible to properly evaluate a world event without an understanding of geographic relationships of countries. Geography makes current events come alive! The interplay of men and nations takes on an added dimension when we see the geographic relationships involved. To understand the master plan of Bible prophecy, it is necessary to have an accurate view of the world. How can one grasp the importance of the Sinai Peninsula in Egyptian-Israeli relations when one believes the Sinai to be in Vietnam? And your very life may well depend on an accurate understanding of world trends and events! Jesus Christ declared: "WATCH ye therefore, and pray always, that ye may be accounted worthy to escape all these things that shall come to pass [including the coming religious persecution to befall this earth]..." (Luke 21:36). God wants men and women with a concerned world view! • If you don't already have one, purchase a world atlas. A new paperback atlas costs just a few dollars. Or you could purchase an atlas at a used book shop for even less. Any atlas will do. • Use your atlas. Open it and really look at the maps. Begin with a map of the world. Notice the relationships of the various continents to one another. Then go to the more detailed maps. Locate all those places you've always heard about but did not take the time to search out. • Keep a note pad or a sheet of paper handy to jot down names of unfamiliar cities, countries, rivers, mountain •ranges or bodies of water that you hear or see on the radio, on television, in conversation, in the newspaper and in magazines. Then look them up in your atlas when you have time. • Listen to or watch news broadcasts with your atlas at hand. Make a point to watch travelogue — type programs and documentaries focusing on current events topics. Your geographic knowledge will grow rapidly in a short span of time. • Parents, become involved with your children. Encourage them to enjoy the atlas. Show them in an atlas or on a globe some of the countries and cities they hear about in school or elsewhere. Establish the atlas — habit in them at an early age. 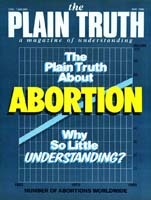 • Continue reading The Plain Truth each month, and listen regularly to the World Tomorrow radio broadcast or telecast. They will alert you to the important trends and events in world news fulfilling major end-time Bible prophecies. If a Plain Truth article does not carry an accompanying map, use your atlas! In this age of mass communication, there is no excuse for geographic illiteracy! It is time to awake to the seriousness of world conditions. As biblical prophecy unfolds before your eyes, prepare yourself to understand fully the climactic events that will engulf the earth!